Is it too late to return to Hearthstone? It's a question worth asking, because video games aren’t these static things anymore; they’re not products, they’re seasons. In a bid to entirely consume an audience, developers and publishers are continually updating their games with new features, new systems, new content. Games aren’t actually released on release day anymore. Instead, they’re launched, and a lot can change during the months and years that follow. Countless are the times I’ve been absorbed by a single game, spending hours learning its intricacies in a bid to master it. I doubt I’m alone in this. But one thing is becoming apparent: Take even the slightest break from the update cycle, and you’ll find yourself completely at a loss. Which leads me to Hearthstone. This is a sticking point for me, a game that – with each new expansion release – I have wanted to return to, hoping that I might once again regain the adoration I had for fine-tuning and finessing my decks through hours of loss and victory. Is it possible to return to a game like Hearthstone, a free-to-play competitive card game that just celebrated its fifth anniversary, and still have a good time with it? Well, there’s no time like the present to find out, right? It’s the familiarity that’s the problem. Booting up Hearthstone for the first time in years isn’t any different an experience to the very first time, though that fancy cinematic at the start kind of threw me. When that iconic, cheery lute begins to play and the Hearthstone case bursts open, it’s hard not to feel a sense of warming familiarity. Then come the messages: Apparently it’s ‘Year of the Dragon’, whatever that means, and there’s a whole number of cards that have changed. And it’s here where that familiar pang of panic sets in. "At first, I made an effort to read each new card’s text, but quickly it became overwhelming." Hearthstone, at its very core, is a numbers game, and at the height of my interest, I knew those numbers well. These mathematical interactions were how I spent my free time, but now those digits have been so openly changed, and these were undoubtedly only the latest changes; what of those too old to be worth mentioning to a returning player like me? I had a lot to figure out, and after opening the numerous packs I’d unknowingly acquired over the years, the fear of having already been left behind was especially draining. At first, I made an effort to read each new card’s text, but quickly it became overwhelming. I clicked through the last remaining cards and resolved to teach myself later, when the time came to rebuild my decks. Credit where’s it due, Blizzard has made some efforts to help players like me. I clicked onto Solo Adventures, knowing that there was bound to be some campaign I could at least work through that would hopefully tease out the now-dormant strategies in a safer, AI-controlled environment. 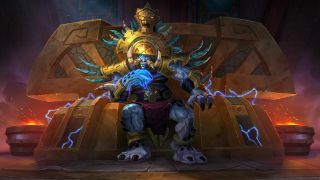 What I didn’t expect was Rumble Run, an added solo mode for Rastakhan’s Rumble – Hearthstone's tenth expansion, which launched back in December. I'm not going to pretend that I know what any of that means, but I will tell you this: It was pretty handy. In offering up one of three classes – I picked Paladin, simply because I could at least remember that this was the class I used to play – and handing me a limited deck of cards to go with it, Hearthstone was doing its best to ease me back into the high-stakes world of CCGs. The concept is simple: Over the course of eight increasingly tricky battles against AI opponents, that initial deck grows through self-chosen additions. I have no way of knowing if Blizzard had designed this mode with returning players like me in mind, but it was integral to slotting me back into the update cycle. By limiting the cards, I could relearn through playing rather than having to flick through page after page of newly added options. I never made it through all eight of the opponents this mode presented, but by the time my character exploded into tiny shards in the fifth battle, I felt a little more at ease. So I did what any sensible player would do: I threw myself in at the deep end and desperately hoped that I would remember how to swim before it was too late. At this point, I wanted to at least test myself in an unranked match but still had to overcome the dread of putting together a new deck. So I cobbled one together, making the most of Hearthstone’s assisting systems that recommended cards I could, or should, replace. I didn’t have many cards from the newer suggested decks, so I went with ‘Classic’ and added in what I could. If I’m honest, I didn’t pay much attention to this. I picked between the two options I thought were best suited to my needs until I was ready and set up with 30 cards. I’d realised that I wasn’t going to win a game fretting about interconnecting maths and stats – the less I know of the current state of the meta the better, right? – so I scrambled pieces together and clicked ‘Play’. If I make a fool of myself, so be it; this is the anonymous internet, I’m fine with giving someone a laugh at my expense. Don't know where to begin? Here are the best Hearthstone decks for beginners. What I didn’t anticipate was the tension I felt in the pit of my stomach as the spinning loading bar finally clicked onto 'A Worthy Opponent.' This was it, time to test my mettle. I played out the first round fairly carefully, remembering that rushing a minion out wasn’t always the best initial strategy. It turns out, however, I wasn’t the only one panicking about fighting a real, thinking human. My opponent left; I had won by default. The free victory on my quest tracker was nice and all, but I felt deflated. All that worrying about nothing. And so I went again, and this time the player was more forthcoming. It was a surprisingly well-balanced match, too, with me dropping down to 9 HP at one point with a set of 7, 8 and 9-mana cards waiting to play throughout the game. But I won. I played smartly to counter the Warrior player’s aggression, healed what I could, when I could, and placed a timely Tirion Fordring on the penultimate turn and an integral Blessing of Kings on the next – and final – turn. It was thrilling, no less because of the player’s taunts (or perhaps genuine accolades) of “Well played” throughout. So, should you dip back in? I had expected it to be harder to get back into Hearthstone than it ended up being. By the way, I ran to my wife to tell her the news of my glorious victory – to which she couldn’t even raise the muster to feign interest – and I knew in that second that Hearthstone once again had its grips in me. Sure, my collection is severely malnourished with who-knows-how-many expansions' worth of cards to work on collecting, but I hadn’t been as put off by the experience as I expected. In truth, it may be this need to recuperate so many integral cards that eventually put a stop to this elation, but for now, I’m quite happy to start, once again, at the bottom of the ladder. If you're hungry for more card gaming goodness, check out these games like Hearthstone you should be playing right now.